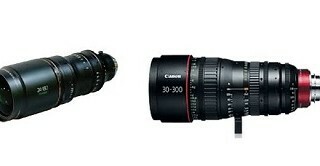 Canon CN-E 30-300mm T2.95-3.7 Cinema Zoom Lens VS Fujinon ZK12x25 25-300mm Lens T3.5 Premier Cabrio Cinema Zoom? I wanted to find out for a client of mine which lens would be the best choice. This is a very expensive purchase and one that has to be made with discernment so why not go to those who have much experience and knowledge? So I went to my friend Jim Mathers, President of the Digital Cinema Society, to ask him his thoughts and so I am sharing with you what he wrote me with the hopes this will be of help to you if you are considering either of these lenses. Although I have not had a chance to shoot with the new Cabrio, I would say the Canon and Fujinon lenses are fairly comparable. If someone had other model lenses of each of those brands, and they were adding a new one, they should probably stay with whichever brand they were already using for matching purposes, because each brand will have a slightly different “look”. All things being equal, I might go for the Fujinon over the Canon just because of the extra 5mm on the wide side, even though it seems slight, it can make a difference. 25mm is a more usable size for a master or wide shot that 30mm. They both ramp, meaning the lose a little bit of exposure right at the long end of the zoom, past about 275mm. Here is what each of the manufacturer writes about their lens. The Cinema Zoom lens CN-E30-300mm T2.95-3.7 L SP (PL mount) rivals best-in-class zoom magnification and telephoto focal length for the Super 35mm format, and is engineered to offer unrivaled optical performance for demanding high-end productions, meeting and exceeding industry standards. The all-new Fujinon ZK12x25 offers the industry-leading zoom ratio of 12x to cover the most frequently-used 25mm wide angle to 300mm on the telephoto end. With its advanced optical performance supporting 4K cameras, the lens delivers premium image quality across a versatile range of shooting scenes. The ZK12x25 features high-precision large-diameter aspheric elements, designed with Fujifilm’s proprietary cutting-edge optical simulation GO-Technology.